What if the water could tell who is touching it? Disney Research: any electrically conductive material can a be touch-interface. 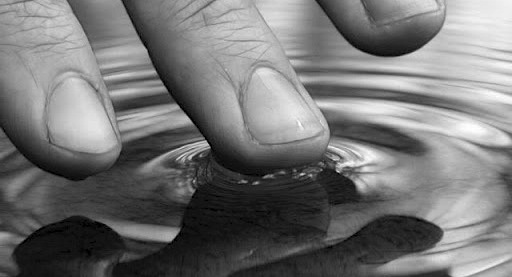 The system, called Touché, has already been demonstrated in a number of impressive practical prototypes created by the researchers — from a “smart doorknob” that can sense precisely how it is being gripped and lock or unlock itself accordingly, to a container full of water that can detect when a person’s hand is skimming the surface or completely submerged to even a person’s own body, which can be turned into an input for controlling the volume of a smartphone or other digital music player. Even more astoundingly, Touché can already reliably distinguish between “categories” of users, detecting whether a child, an adult or even a pet dog or cat is the one doing the touching, and the varying responses of the device being touched can be customized accordingly. “Of course sometimes it may make mistakes, but in general it was reliable,” Poupyrev said. The effective range of the sensing area is around 50 centimeters for now, but Poupyrev said it can easily be increased by turning up the signal. He also told TPM that it took him and his colleagues about a year to develop the working prototypes shown off in their video, and that they have a patent pending on the work.